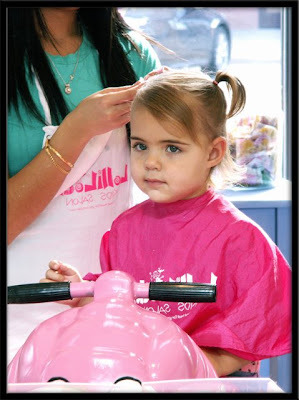 Alex had her first haircut at Lollilocks, a cute children's hair dresser with so many services that it is in fact, in my opinion, a Spa for children. She was so good - sat there quietly and content watching Ms. Tina trim her little baby locks. Thank goodness Ms. Tina did not go too short because I think Kev would never let me take the kids to have their hair cut again. I must admit I was a bit nervous returning to the very place that thought the pixie look on my child would be cute - my opinion, if ever asked, would have been that the pixie look is cute, but on someone else's child - but I was never asked. Instead we were forced to accept the short Bob after the big reveal when Ms. Lolly asked if it was too short. I guess it was a rhetorical question because a No answer would be lying and a Yes would certainly not put 4 inches back on her head. It took me all of 10min to fall in love with her new do but it did take her Dad a bit longer to love it too. This time round we made sure that the communication channels were wide open and any Scissor Happy Snipping was left for someone else's child. Oh my!!! What a sweet little doll she is!!! Such a sweet picture Kazan...what a trying story you tell...WOW, I may have not been so nice!!! LOL!!! HUGS!!! She is just too adorable!!! Such a gorgeous little girl you have! Let's Party! It is WCMD!